The Mid-Tertiary Azuara impact event with the formation of the Azuara impact structure and the elongated Rubielos de la Cérida impact basin (Fig. 1) is exceptional among big terrestrial impact sites not only because of its size of the multiple arrangement of the structures as such but also because of the excellent outcrop conditions and the easy access. On our impact websites this has extensively been shown and debated. Fig. 1. Location map for the Fuentes Calientes suevite outcrop. 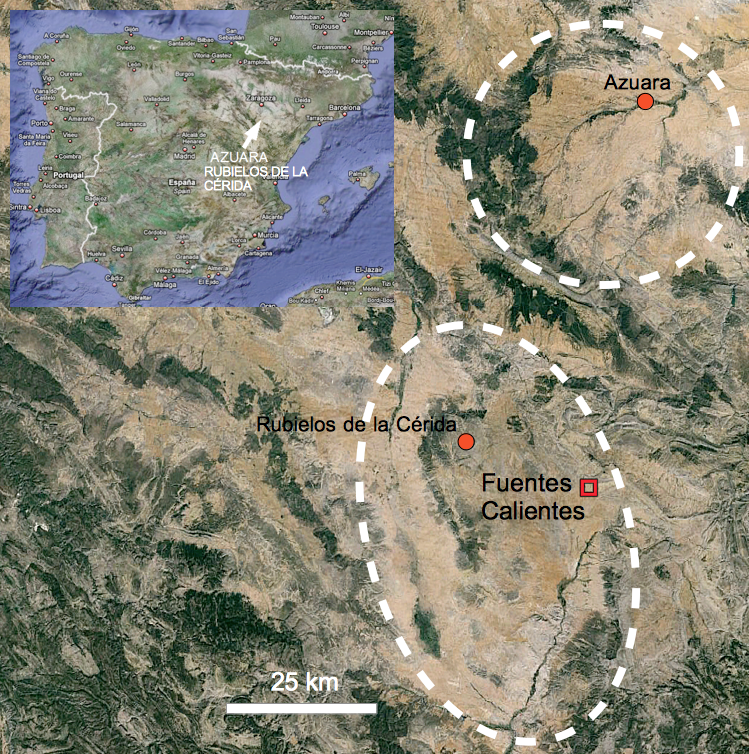 Encircled are the Azuara impact structure and the elongated Rubielos de la Cérida impact basin both establishing the big Mid-Tertiary Azuara multiple impact event. 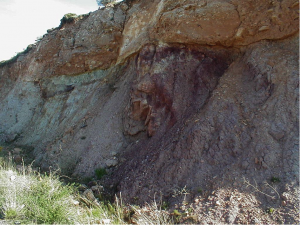 Here on our impact educational page we want to pick out one of the most illustrative outcrops in the Rubielos de la Cérida impact basin to show basic geology of a big meteorite impact event, and the study is in particular recommended to those geologists who are not convinced that the giant Azuara impact event has ever happened. 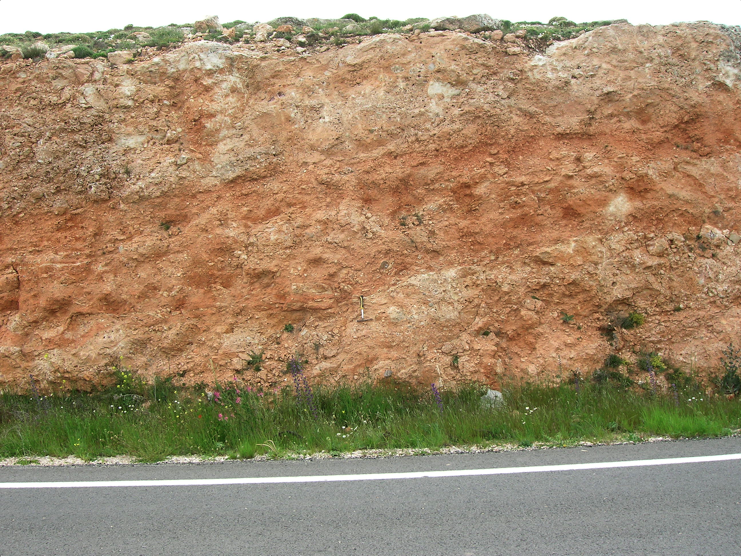 The outcrop is exposed roadside between the village of Fuentes Calientes and the N-420 Carretera Nacional (Fig. 1) and shows the excellently uncovered contact between a prominent suevite layer and the autochthonous Cretaceous footwall which is in detail being described in the images that follow below. Fig. 2. 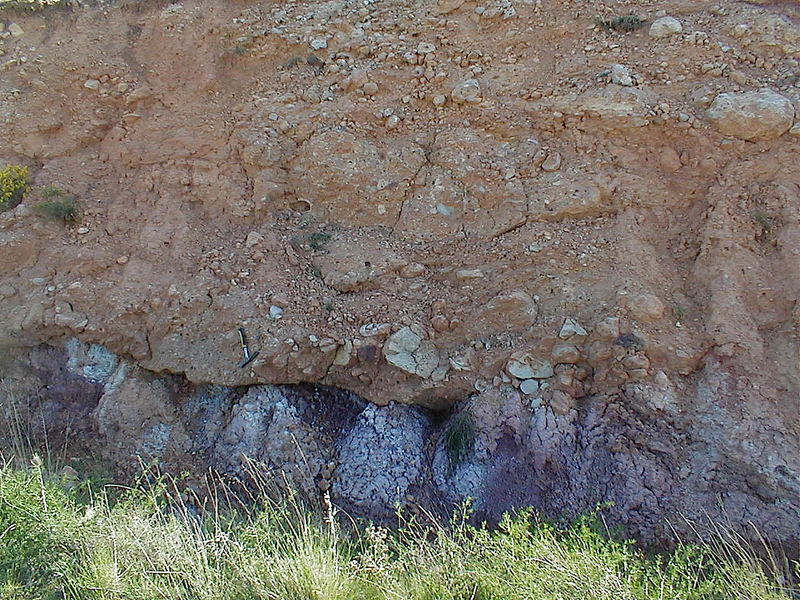 The multicolored Utrillas formation (or facies), Lower Cretaceous, Albian, is mostly composed of slightly consolidated quartz sand. Ahead the village of Fuentes Calientes the razor-sharp contact to the overlying suevitic basal breccia is most impressive. Here we remind of the definition and detailed description of the basal impact breccia and refer to the text we have written elsewhere (click here). 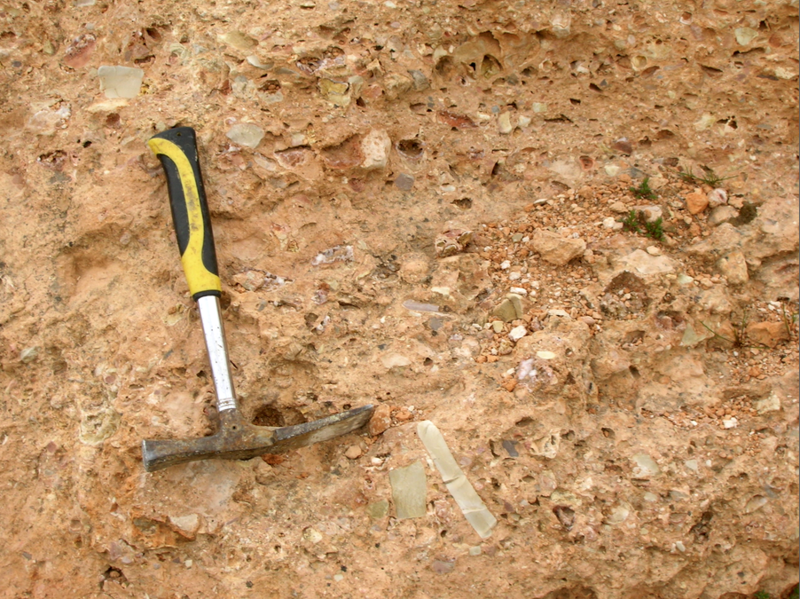 The extremely sharp contact without any re-working or soil formation suggests sudden erosional action of the deposition of the basal breccia in a probably more or less flowable condition which is supported by more images to follow. Fig. 3. 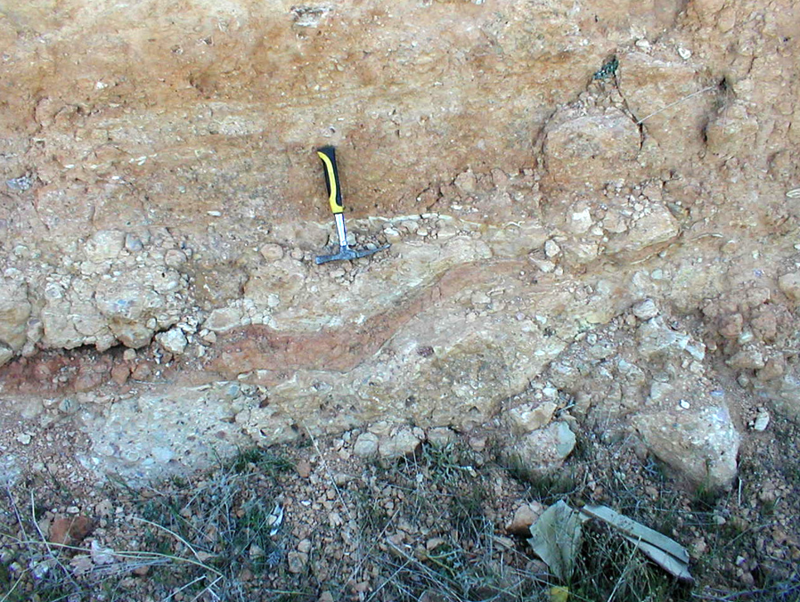 One more aspect of the sharp contact of the suevitic basal breccia over Utrillas autochthonous (or parautochthonous) layers. Fig. 4. Closer look at the contact zone (hammer for scale). 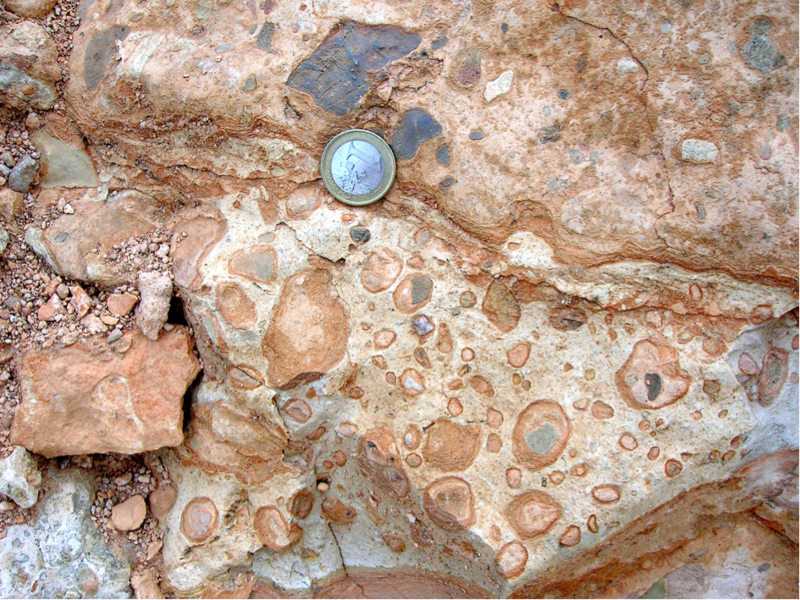 The rounded limestone clasts must not doubt the breccia character of the suevite, since the impact target was to a large extent composed of Lower Tertiary conglomerates, and even the impact process itself was able to produce well-rounded cobbles and boulders which we have shown to exist at many places in the impact area and which we have termed impact in situ conglomeratization (see, e.g., HERE). Fig. 5. Going into more detail …. Fig. 6 A. 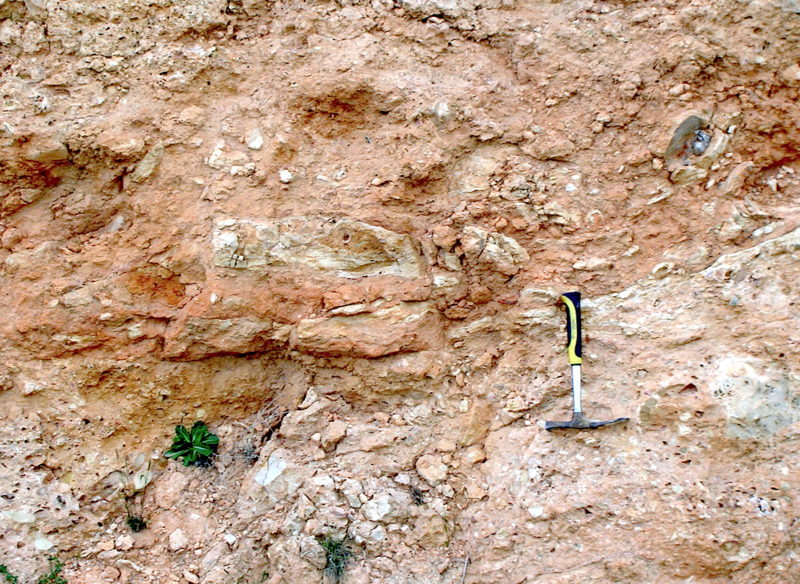 A mighty, sharply contoured dike-like intercalation of somewhat different facies (outlined in Fig. 6 B) cutting through the suevitic basal breccia. Fig. 6 B. 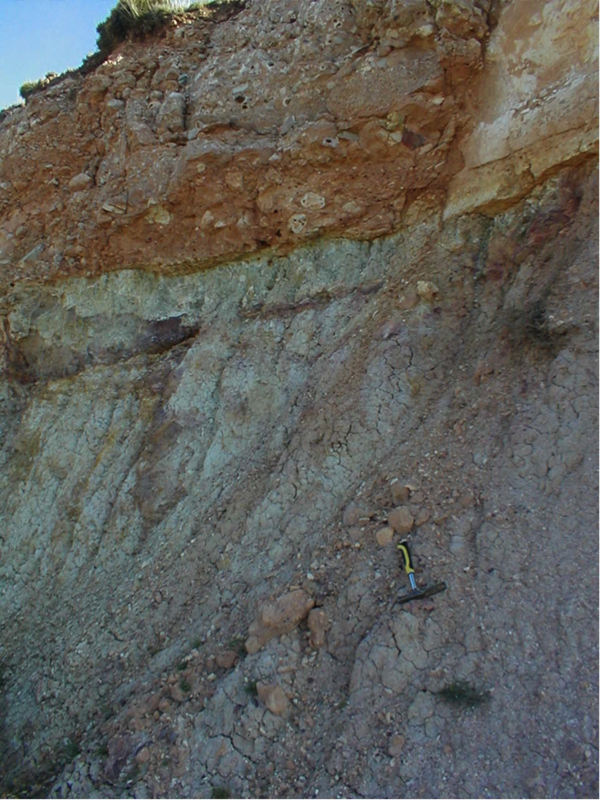 The sharply contoured intercalation points to an obviously complex process of deposition of the suevite layer that reminds of the Ries impact crater and the suevite deposition there. While the hitherto accepted model for the Ries suevite deposition considered predominant fallback from an upward-rising and then collapsing plume of a mixture of vapor, rock melt, lithic and mineral fragments, newer studies (C. Meyer, N. Artemieva, D. Stöffler, W.U. Reimold, K. Wünnemann (2008): Possible mechanisms of suevite deposition in the Ries crater, Germany: analysis of Otting drill core. – Large Meteorite Impacts and Planetary Evolution IV (2008) 3066.pdf) are moving more towards a model of pyroclastic flow. Such a mechanism should be contemplated also for the Fuentes Calientes suevite (and other suevite deposits in the Azuara/Rubielos de la Cérida impact region), and, vice versa, the authors of that paper could possibly find support for their model by visiting and studying the Spanish suevite outcrops. Fig. 7. Close-up of the intercalation contact zone from Fig. 6 (hammer in the same position). 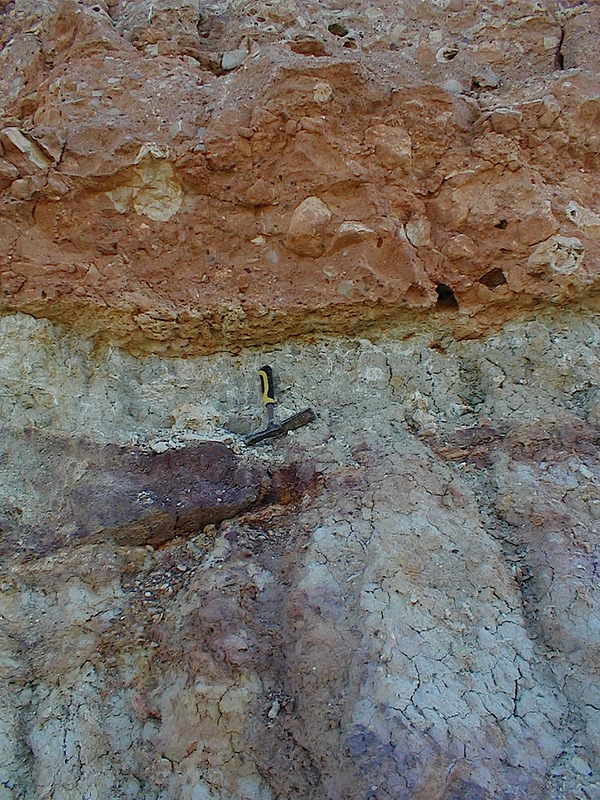 The many adjusted limestone clasts within the intercalation (above the hammer handle) reflect flow texture and possibly support the pyroclastic flow model. Fig. 8 A, B. More dike-like intercalations underline the concept of a very complex suevite deposition, and we again refer to the consideration of Meyer et al. (2008) and cite: “It is quite possible that the mechanism of the [Ries crater] suevite deposition was much more complicated: the occurrence of density currents with various gas/solid material ratios makes a combination from diluted fallout to a dense basal flow deposition possible”. Fig. 9 A, B. 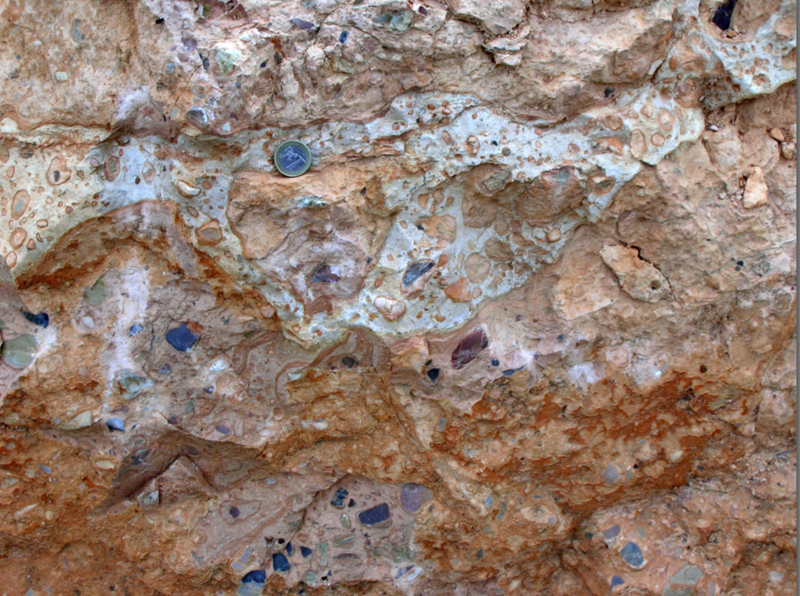 Typical aspects of the suevite breccia with the multicolored spectrum of rock fragments from the sedimentary impact target stratigraphy. Fig. 10 A, B. The hollow-cobble facies. Several parts of the Fuentes Calientes suevite deposit show this peculiar facies that is not uncommon in the Spanish impact region and is considered a direct outcome of the impact shock that led to decarbonization and/or formation of carbonate melt. 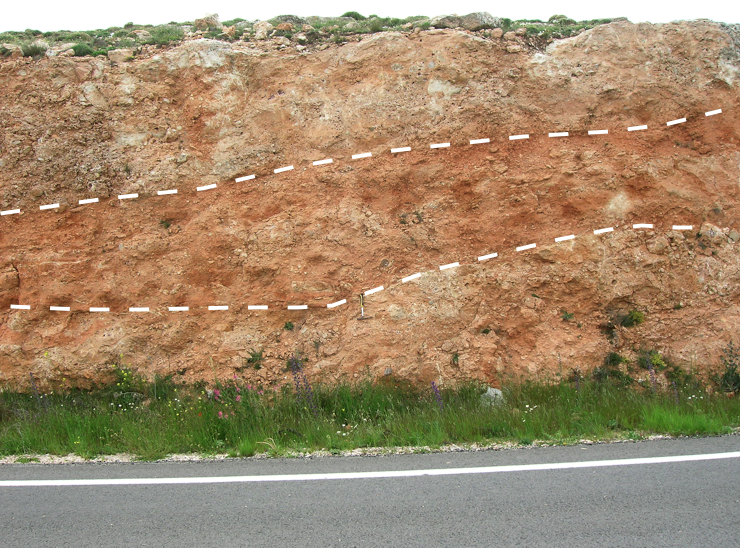 For the highlighting Jaulín impactite deposit (Fig. 11) we developed two models of formation of the hollow cobbles (click here ) although the process is anything but fully understood. Fig. 11. For comparison: The hollow cobbles from the Jaulín impact breccia deposit in the northern rim zone of the Azuara impact structure. For more impressive photos from the Jaulín outcrop see HERE! Fig. 12 A. 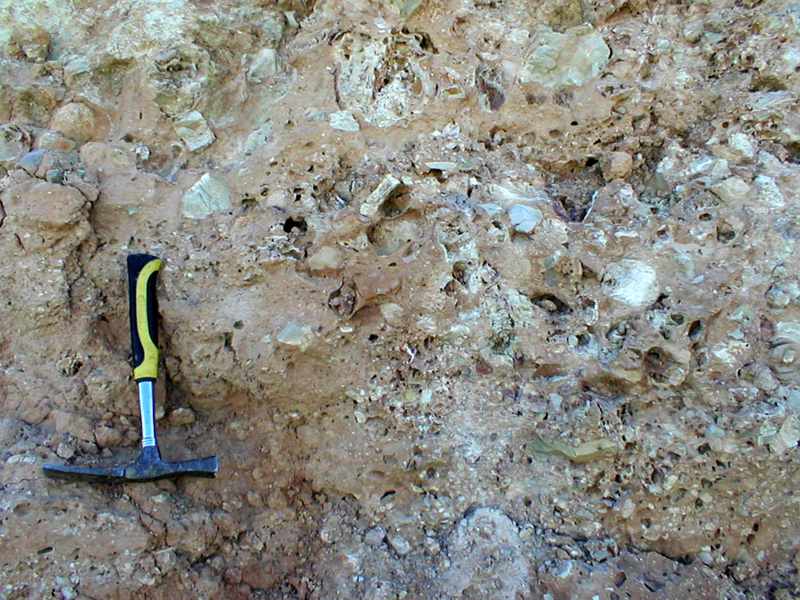 The accretionary lapilli facies of the Fuentes Calientes suevite. 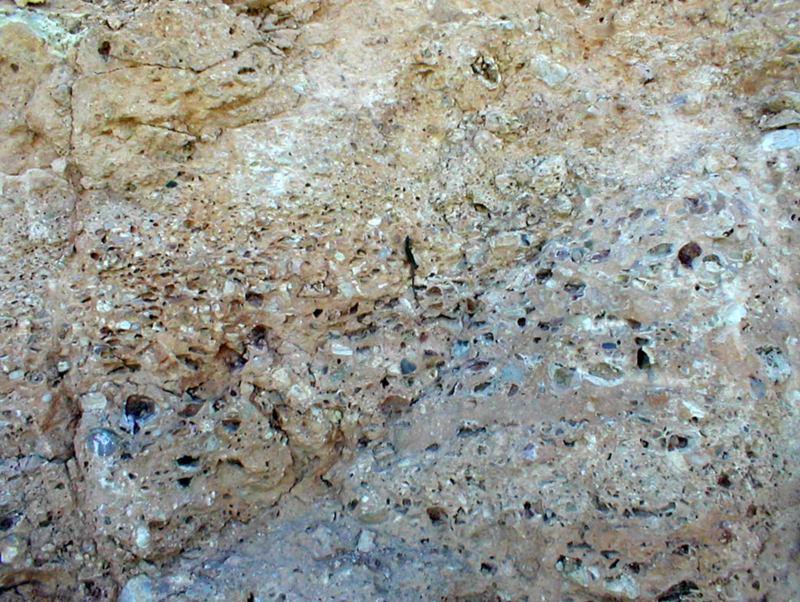 The “zoo” of peculiar components of the Fuentes Calientes suevite is enriched by the occurrence of accretionary lapilli embedded in a carbonate matrix to feature a kind of lapillistone that in the form of a dike system sharply cuts through the suevite breccia. Details in Figs. 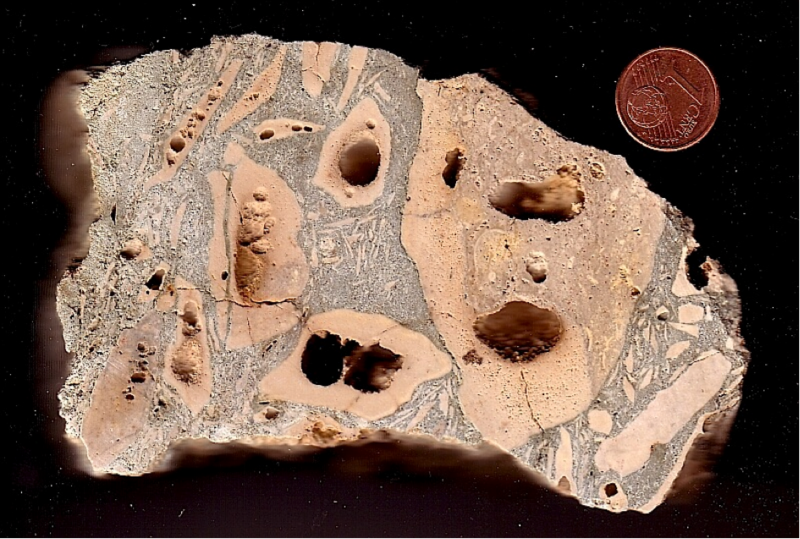 12 B, C. Accretionary lapilli are frequently observed in various impact structures and have possibly been described for the first time by Graup (1981) to occur in the suevite of the Ries impact crater in Germany. 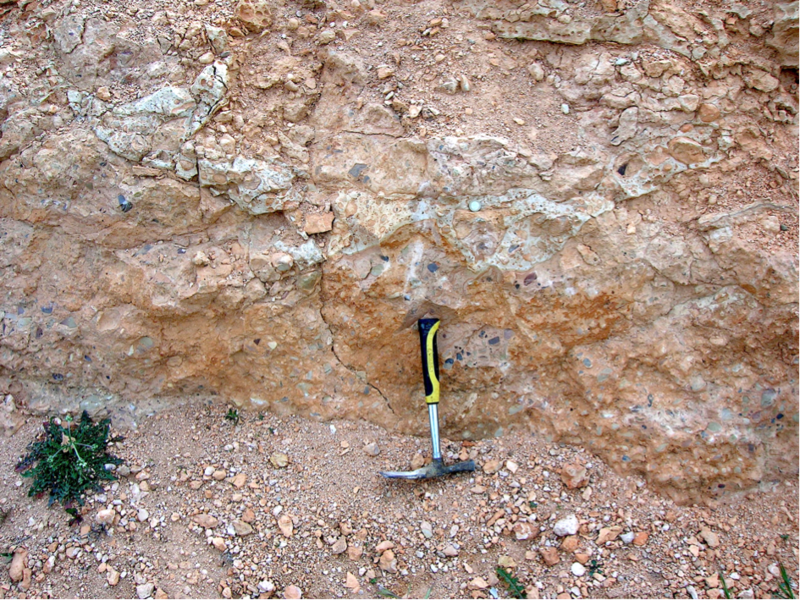 In the Azuara and Rubielos de la Cérida impact regions the formation of accretionary lapilli is frequently observed (click HERE, and HERE). Fig. 12 B. 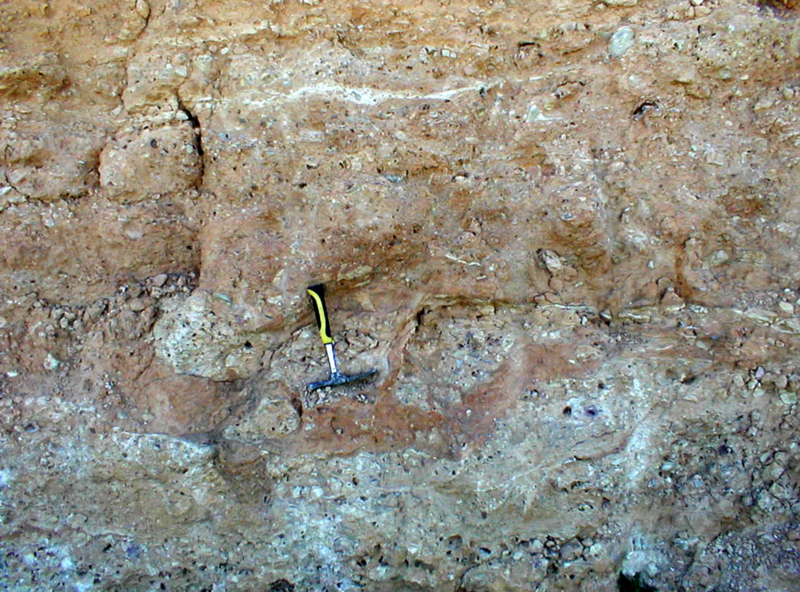 Closer view of the lapillistone dike system that must have been emplaced after solidification of the suevite main mass. Otherwise, a mixing of the materials should have occurred. Fig. 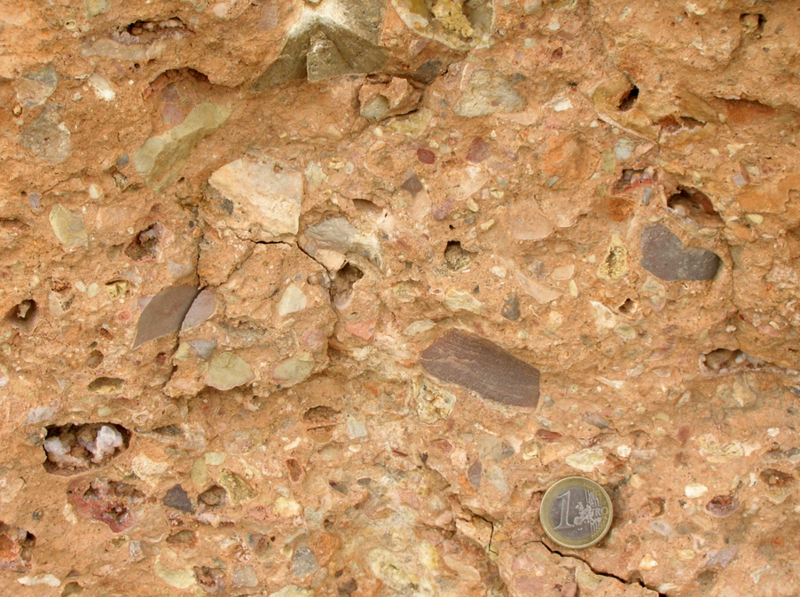 12 C. Close-up of the accretionary lapilli facies. Typically, the individual lapilli reveal the onion skin internal structure around a stony core.